Three institutions--Oxford University, Rice University, and Open University--have added e-books for free download through iTunes U, Apple's educational area in its iTunes Store. Each is taking a unique approach to the selection of its e-books, but all are using the EPUB format. EPUB (for electronic publication) is a standard created by the International Digital Publishing Forum, a consortium of publishers such as O'Reilly Media, other companies such as Adobe and Cengage Learning, and organizations like the Internet Archive. All files in this format end with the extension EPUB. They can be read on most smart phones and e-readers. Britain's Oxford has made Shakespeare's First Folio available in the EPUB format. The 36 texts, which include their original spelling, have been prepared by the staff of Oxford University Press' Shakespeare Department. The university has also published six plays by contemporaries of Shakespeare, including The Duchess of Malfi by John Webster. The Tempest, one of the works made available, is about 95 kilobytes in size. 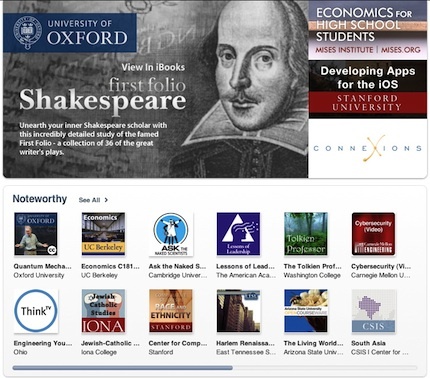 Recently, Oxford had its 5 millionth download of audio and video materials from iTunes U. "It's great to have released free EPUBs of both First Folio Shakespeare plays and lesser known works. I hope that this material will be enjoyed as widely as possible," said Emma Smith, lecturer in English literature at Oxford, whose lectures on iTunes U, "Not Shakespeare: Elizabethan and Jacobean Popular Theatre," have been favorites with listeners too. Oxford, Rice, and Open University have made digital books freely available in the EPUB format through iTunes U.
Houston-based Rice U has added 18 of its most popular free textbooks available on iTunes, including "Advanced Algebra II," "Collaborative Statistics," "Fundamentals of Electrical Engineering I," "Understanding Basic Music Theory," and "Programming Fundamentals: A Modular Structured Approach using C++." The algebra file, as an example, is about 2 MB. The university has posted the textbooks through Connexions on iTunes. This open education organization begun at Rice is dedicated to publishing scholarly content. The repository, which is separate from iTunes, currently contains 17,141 educational modules that are grouped into 1,029 collections. Many collections were compiled by university faculty and are already used as textbooks, either by students who access them online for free or print them at low cost. The modules are available in EPUB and PDF formats. Instructors and authors can modify the material for any purpose. The organization provides free and open source software to help students, faculty, and writers manage the content. The Connexions site generates about 2 million visitors a month. "The demand for free, high-quality educational texts and teaching materials is greater than ever, and people increasingly want to access that material on mobile devices," said Joel Thierstein, executive director of Connexions. The Open U has published 100 titles from its OpenLearn Web site and has said it expects to add an additional 200 before the end of the year. The content is derived from current courses so students can use these materials to explore a topic before signing up for formal learning from the UK-based online institution. The Open U's administration said it considers its approach to e-books unique. "We do not simply rework existing material and old style textbooks into an electronic format, but design carefully thought-through, interactive features that give the best all-round learning experience," said Martin Bean, vice-chancellor. "For example, if you are looking at a course on genetics, as you read the narrative the embedded audio and video illustrate key points as you go along, and if you are learning about Schubert's Lieder, with an OU ebook it's easy. You can hear the music as you follow the score. This really helps to bring subjects to life and simplifies things for students, as you don't have to be online or carry lots of different materials." The Lieder download is about 20 MB. The university's OpenLearn Web site contains 6,600 hours of free, current course materials and has had 14 million visits to date. Its content has been downloaded 27 million times on iTunes. iTunes U can be accessed directly within iTunes here.